LOS ANGELES, March 18, 2019 /PRNewswire/ -- F45 Training, the fastest-growing fitness franchise in the world, announced today that an investment group led by Mark Wahlberg and FOD Capital has become a strategic investor through a minority stake in the company. The Australian-born company undertook an extensive marketing process to identify the best growth-oriented investor, ultimately concluding that the Mark Wahlberg Investment Group was the best partner to accelerate F45 Training's ambitious global growth plans. This investment and partnership will ensure the continuous large-scale expansion of F45 Training across the globe and increase brand awareness, specifically in the high-growth U.S. market. The F45 Training management team, including founder and CEO Rob Deutsch and his business partner Adam Gilchrist, will continue to lead the company through its next phase of global growth. This new partnership will enable F45 to improve its systems and processes to the benefit of members and franchisees while continuing to deliver its proven functional training workout to millions of F45 enthusiasts across the globe. "This is a monumental transaction for F45 Training. When we started the company, we knew we had something special and had bold plans to create a global fitness movement," said CEO Rob Deutsch. He continued, "The immense interest we were able to generate through this process proved the strength of the F45 platform and we are excited to embark on this partnership with Mark Wahlberg and his team of investors. 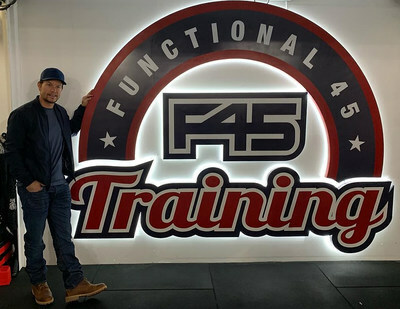 Mr. Wahlberg's genuine passion for fitness, proven business acumen and shared vision for F45 Training made this an ideal fit for the company, and we are proud to welcome him into the F45 family." What started as a single Australian studio has transformed into the world's fastest-growing fitness franchise. Since its inception, F45 Training has pioneered the fitness industry with its innovative training and technology systems. This relentless focus on innovation, scalability, and the development of a great product have allowed the company to grow to over 1,500 studios across 40 countries, becoming a fitness phenomenon unlike any other. The 45-minute, station-based, heart-rate monitored functional training concept has helped tens of thousands of people achieve their fitness goals and become a part of a global fitness community. Community networks that promote fitness, good health and personal growth are forged in F45 studios around the world and are the source of F45 Training's strength as an international brand. "Together with my investors, we are excited to be working with F45 Training. The founders of F45 Training have done an incredible job building a global brand, and with this partnership, we hope to continue disrupting the fitness industry," said Mr. Wahlberg. He continued, "The strength of F45 is that people of all fitness levels will find motivation and support in an F45 studio. We look forward to inspiring people all over the world to pursue their health and fitness goals by introducing them to F45." F45 Training is thrilled to work with Mr. Wahlberg and his team to take F45 Training into a new and exciting era of growth and innovation. More information about F45 Training is available on F45 Training's website. Follow F45 Training on Facebook, Twitter, and Instagram for the latest news and trends. Deutsche Bank Securities Inc. served as exclusive financial advisor to F45 Training. Baker McKenzie served as legal counsel to F45 Training. Dickinson Wright served as legal counsel to the investment group. Founded in 2012, F45 Training (https://f45training.co.uk/), is a unique team training workout unlike any other. The workout merges three separate leading-edge fitness training styles – high-intensity interval training (HIIT), circuit training, and functional training – into one, consummate and compelling group training experience for its members. This fusion has led to the development of 36 unique 45-minute workout experiences, with additional workouts under development by the F45 Athletics Department. F45 Training's daily workouts vary the amount of exercise stations, the work time/rest time ratio and the number of repetitions through a daily exercise circuit. This provides a challenging—and ever-changing—workout for its clientele. This combination of interval, cardiovascular and strength training has been proven to be the most effective workout method for burning fat and building lean muscle. The company was recently ranked on Entrepreneur's Franchise 500 as well as Entrepreneur's Fastest-Growing Franchises of 2019. Visit https://www.f45invest.com for franchise opportunities.